As a mobile worker, you know that your smartphone or laptop can make or break your productivity for the day. How many times have you heard your coworkers complain that “technology issues” were causing a delay? Then there are some things you wish your smartphone could do, but it can’t — like help you annotate documents on the fly, land more international business, make presentations simpler or get customers to sign contracts faster. Even the best smartphone can’t do it all, right? Wrong! Remote, flex and mobile workers are now the majority — about 70 percent of professionals work out of the office at least once a week, according to a recent study by the International Workplace Group. That’s why the Samsung Galaxy Note9 is designed with mobile professionals’ needs in mind. It’s jam-packed not only with the best tech available, but also new productivity features that help you make the most of every minute, inside the office or out. The Note9 with its upgraded S Pen gives users the most advanced version of Samsung’s Screen Write feature. Screen Write lets you quickly and easily annotate, edit and highlight documents and pictures on the fly with your natural handwriting. You can also write directions and draw arrows on maps, write captions on images and allow your prospective customers and new or current partners to sign documents on-screen. See how easy it is to make the switch to Samsung in this infographic. If you can see it, you can translate it with the Note9. 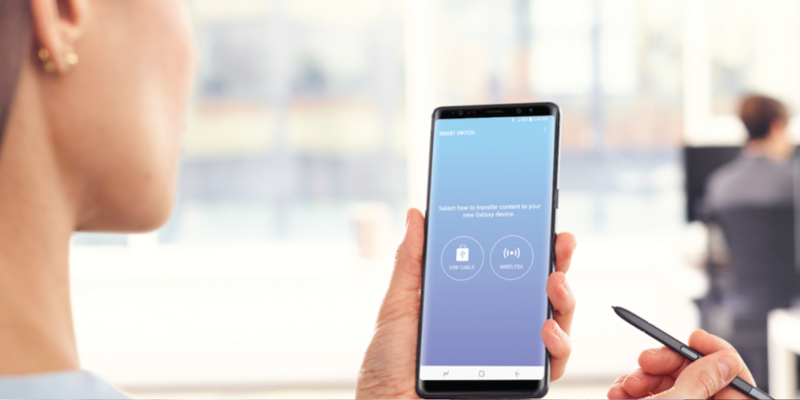 Simply scan any text in over 40 languages by viewing it on-screen, and the Note9’s optical character recognition (OCR) capabilities take over, doing the hard work for you. If you want a particular word or phrase translated, hover over it with your S Pen and tap the audio icon if you’d like to hear it pronounced out loud. Need to showcase your latest work, document an issue or take photos or videos of your incredible team? The Note9’s professional-quality cameras, gets everyone’s good side. The 12-megapixel rear camera has a dual aperture F1.5/F2.4 lens with a 2x optical zoom (it can also record video at ultra-high-definition 4K resolutions at a very-fast 60-frames-per-second). Then, edit your images by booting up Samsung DeX on a monitor tethered to your Note9 and running the Adobe Photoshop Lightroom CC app, or your favorite photo editor. It’s hard to top a first-rate camera matched with the best image editing experience, all powered by a single device. Never stumble when setting up a presentation again — using Samsung DeX, you can connect your Note9 directly to any HDMI display and get going instantly. Control the flow of your slides by clicking the button on the Bluetooth-enabled S Pen. Besides helping you deliver your talk in a professional manner, the S Pen can also be used later as a drawing tool as you lead a brainstorming session and take notes on an on-screen whiteboard created by your Note9. Learn more about how the Samsung Galaxy Note9 can help you raise productivity and overcome your business challenges.